Financial Crisis happened in 1997 which brought many ‘Changes’ in Korea. Based on IMF’s support, Korea experienced a huge amount of company downsize, split, sale and liquidation. The CCY arbitrage cased the high interest rate and brought up the price rise of export raw material and oil. It gave Korea a lot of difficulties and credit dropped internationally. Also High pressure-Reorganization of Financial Industry resulted in Financial Institutions’ liquidation, Operation stop and M&A. These new economic changes caused insolvent obligation, M&A, and offered various investment and the opportunity of industry reorganization. As many global private fund and Principal Investment of Investment Bank increased, the investment type of ‘Private Fund’ was introduced in Korea’s Financial Market. Financial Crisis of Korea gave investors both of good opportunity and high risk. With ‘High Risk – High Return’, global Private Fund and Investment Bank started to invest in Korean Market. Private Fund’s investment from 1997 to 2000 focused to Insolvent Obligation with Financial Institutions’ reorganization resultant from environment. And Investment in Korea started with Insolvent Obligation’s buy was continued to invest various business and industries with economic recovery. With economic recovery after financial crisis, Investment ways of private fund was changed to different ones. It invested various business and industries actively. Based on global private fund’s investment in Korean market, it concentrated investment (around 86% of total investment) in Insolvent Obligation and Financial Institution during Financial Crisis (1997-2000) was dispersed through economic recovery. We found out it through 2001-2004’s investment trade that around half of investment amount was concentrated to various and wide scope such as telecommunication, File & Video Prod., Food Prod, Buildings & Cons and Real Estate/Property excluding Financial Industry. Investment Rage/Target’s expansion through economic recovery from 2000 and Capital Market and Financial Investment business Act are causing more competition. Expected increasing M&A through the launching of Capital Market and Financial Investment business Act will offer domestic/oversee’ Private Fund various Opportunity, Challenge and competition. In the initial time Domestic Private Fund tended to invest with strategic investors not independent investment. However currently it is acting actively and Kansus Asset Management is a good example which made consortium with stock option in Medison. It’s been a long ago since the portion of foreigners passed over 40% in the securities markets of Korea. They are mostly financial investors, or PEF rather than strategic investors. These foreign PEF played important roles during overall economic restructuring procedure after the currency crisis in Korea. It was established in 1995 starting from insolvencies of US Savings and Loan Association(S&L) in late 1980’s US based PEF Specialized in buying real estates, companies, insolvent bonds. It is registered in Hamilton, Bermuda for the tax haven but in fact operates in Dallas, Texas. It launched in Korea in 1997 right after the currency crisis and major investors consist of the state governments of US, pension funds, university foundations, public foundations, Texas oil companies, financial holding companies, private school foundations, and so on. It began to buy large buildings of Korea from 2000 for the purpose of capital gain and gained the profit of KRW300 bil. when it bought Gangnam Star Tower at KRW633 bil. from Hyundai Development Company in 2001 and sold it to GIC(Gov’t of Singapore Investment Corp.) in late 2004. It bought Korea Exchange Bank(KEB) at 1,380 bil. Won in 2003 and sold at 6,410 bil. Won with the profit of 4,500 bil. Won when considering exchange rate. It is the most famous name in M&A deals of major companies in Korea, US based PEF established by Texas Pacific Group(TPG) and Blum Capital, to expand investments in Asian market. It pursues its capital gains mostly from the huge buyouts over the amount of $50 mil. per each case and manages more than $1.7 bil. of assets in Asia. It has its offices in Seoul, Tokyo, Hong Kong, and Shanghai, etc. It gained a huge profit of KRW 1,150 bil. in Korea from buying Jeil Bank in 2000 and selling 5 years later. Corporation should pay tax 25% of profits but New Bridge didn’t pay anything because it is registered in Malaysia and pays there according to the Tax Agreements of the ‘Prohibition for Double Taxation’. It’s the largest PEF in the world which was established by David Rubinstein and William Conway who had been Special Adviser of US policies when Carter was in his presidency in 1987. It holds investors such as the government investment authorities, US state pension funds, and rich families over 550 from Singapore, UAE, and 55 countries. It is well known to many people by threatening KT&G with the pressure of ruling stake. It is led by Carl Icahn, the 20th richest in US, who is over 70 years and the company hunter and earned $0.7 bil. from Texaco sue case in 1987 and $0.8 bil. from Navisco’s division separation case. It emphasized that they are long-term investor and bought large stakes of SK and became the second major shareholder in 2003. However, they left Korea in July, 2005 with holding just for 2 years with big profit from selling all of their stocks like LG Electronics and LG Corp. of which they said they would invest rather long-term period. 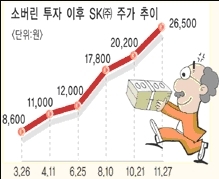 After Sovereign’s case, the sentiments of anti-foreign companies prevailed in Korean capital market, because it showed apparently it pursued the short-term margins by threatening the ruling rights of SK. This section covers major tax implications for Private Equity Fund ('PEF') which is domiciled in Korea. Capital registration tax would be levied on a Korean company’s paid-in-capital at the basic rate of 0.48% (including education surtax) when the capital is registered with a court. If the company has its headquarters in the Seoul Metropolitan area, capital registration tax increases threefold to 1.44%. However, the higher tax rate is not applied to a PEF. When PEF acquires shares in Korean companies, it would be exposed to Securities Transaction Tax and Deemed Acquisition Tax and Value Added Tax implication. Securities Transaction Tax ('STT'): Transferors of shares in a Korean company are liable to STT at a rate of 0.5% (0.3% in the case of a listed company traded on the stock market) on the transfer price. A seller should be liable to STT in normal cases. In case of share transfer between non-residents, the buyer should be liable for STT. Deemed Acquisition Tax ('DAT'): A shareholder who acquires more than 50% of a Korean company (“majority shareholder”) should be subject to DAT. The logic behind is that the majority shareholder is deemed to be indirectly acquiring the company’s assets that would be subject to the asset acquisition tax if acquired through as asset purchase (e.g., land, building, golf club memberships, vehicles, etc.). The DAT is calculated by multiplying the book value of the company’s assets by the applicable tax rate (i.e. 2.2% or 2.0%), and then multiplying the result by the majority shareholder’s ownership ratio in the Korean company. Value Added Tax ('VAT') : A PEF established under the Financial Service and Capital Market Act (FSCMA) is considered as VAT exempt and thus, the transaction by the PEF should be exempt from Korean VAT. If PEF makes profits from the investments, corporate income tax implication would arise. In general Korean companies (incl. PEF) should subject to tax at a rate of 24.2% (to be lowered to 22% from 201n and onwards) including 10% resident surtax (a rate of 12.1% applies to the first bracket of KRW 200 million). However, PEF actually would not suffer any corporate income tax thanks to (i) Dividend Distribution Deduction and (ii) partnership taxation regime. Dividend Distribution Deduction ('DDD') : With respect to a PEF registered with Financial Service Commission (“FSC”) on or before December 31, 2008, earnings distributed from the PEF to their partners are excluded from PEF’s taxable income, provided 90% or more of distributable earnings are distributed to its partners. This benefit is no longer available to a PEF which is registered with the FSC on or after January 1, 2009. Instead, a PEF is able to elect partnership taxation regime for its income tax purpose and be exempt from taxation at a PEF level. Partnership Taxation : A PEF can be able to elects partnership taxation regime under which PEF is considered as a look-through entity and thus, is not subject to corporate income tax. Instead, the partners of PEF are regarded as a tax payer. Income earned by a PEF should be allocated to each partner in principle, based on each partner’s share in PEF. Then, the income allocated to each partner should be subject to individual or corporate income tax according to investor’s profile. Profit earned by PEF would ultimately be distributed to its partners. In this case, withholding tax (WHT) implication on the distribution would arise. The income allocated by the PEF to limited partners will be classified as a dividend. 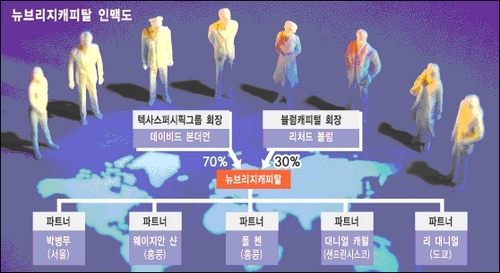 The withholding tax rates (including resident tax) applicable will be as the following: (i) 0% for Korean individuals and Korean companies; and (iii) 22% for foreign residents or companies (concessionary WHT rate eg., 5~15% can applied if tax treaty is concluded between Korea and the country where the partner resides). The income allocated by PEF to General Partner would not be subject to WHT. Instead, GP should pay on corporate income tax on such income as the same manner which is outlined above paragraph ‘corporate income tax’. The big companies in Korea like Samsung, LG, SK and Hyundai, are called Chaebol or conglomerate. They have the corporate governance in which ownership and management are the same. Although the share of the CEO and shareholder is sometimes too small to control the whole company or groups, they have controlled. It is in the contrast with the western corporate governance in which ownership and management of a company are separate. Chaebol use circular shareholding, cross shareholding and pyramid shareholding among business groups, which make them control many business groups by small shares. Some NGOs have insisted that the corporate governance of Chaebol is not transparent nor good for other shareholders. The trend against those governances has got its day especially since Asian financial crisis in 1997. When the Asian financial crisis went through the climax and faded out little by little, PEF got active in Korea. They bought the controlling shares of Korean big companies as they insisted they would revise the corporate governance of Chabeol and raise the corporate value. The Sovereign Fund is a good example which shows the circumstances in those days. The Sovereign and its affiliate, the Crest Security Fund bought many stocks of SK Inc, as they claimed the governance of the company was not good and they would participate in the management in 2003. They argued that Choi Taewon, the controlling shareholder and CEO should resign. Choi Taewon gathered friendly shareholders and fought against Sovereign’s attack. After they struggled for controlling right of the company for two years, the Sovereign sold their all shares of the company and it earned more than 800 billion won as a trading profit. The care for corporate governance and management transparency of Korean companies led some Korean people who engaged in social movement, to create social responsibility fund. For example, Jang Hasung who is the professor of Korea University and was the president of the People’s Solidarity for Participatory Democracy(PSPD) established the Korean Corporate Governance Fund which aimed at upgrading the corporate governance in 2006. It was sensational at that time and many me-too investors followed the activity of the fund. But these days many specialists think the Jang Hasung fund is just one of many PEFs which are not different from others. And many people doubt the PEFs really had been tried to fix the corporate governance or only to pursue trading profit in Asian financial crisis period. Since global financial crisis started from U.S.A in 2007, some economists and CEOs doubt whether Western style corporate governance is always right or good for the firm and the whole economy. In recent days, PEFs don’t make a voice about corporate governance. They say they can give money to Korean companies which lack of liquidity in global financial crisis and help them restructure themselves. The Korean government and financial supervisory office has also the willing of utilizing PEF for restructuring Korean companies. PEF comes out in so various faces according to the social and economic circumstances. 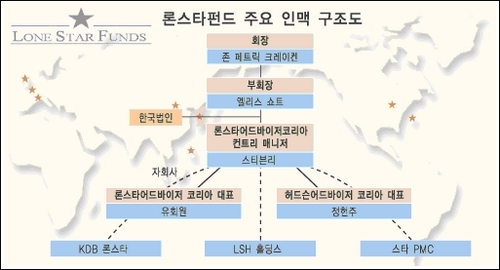 One of the most famous scandals of Private Equity Investment is Lone Star Fund’s acquisition of Korea Exchange Bank (KEB) in 2003, as a part of general reorganization of the South Korean financial sector following the Asian financial crisis. In 2006, Lone Star tried to sell the company to Kookmin Bank, but the plan was failed because of the investigation by prosecutors. As the National Assembly finance committee has filed the complaint regarding suspicious misconduct on the Lone Star’s acquisition of Korea Exchange Bank on March 7th of 2006, Central Investigation Division at the Prosecutor-General’s Office started investigation forming a special investigation unit. This investigation is focusing on 1)Corruption case on KEB sales, 2)Case on tax evasion and professional malpractice, which is accused by the National Tax Service and the Financial Supervisory Services, and 3)Case on stock price manipulation of KEB Credit Card (KCC), filed from Financial Services Commission. It is suspected that during the sales process, the head of the Finance Ministry’s financial policy bureau and the president of KEB have collusion with Lone Star Fund, and they underestimated KEB’s asset and overestimated bad debt so that they can sell under the fair price by minimum KRW 344 Billion, maximum KRW 825 Billion. Also, they are suspected that they intentionally underestimated BIS ratio of KEB, so that Financial Service Commission could approve Lone Star’s acquisition of KEB. Lone Star Fund is suspected in evading tax by KRW 11 Billion and malversation of KRW 24 Billion by manipulating the earnings of its 14 special-purpose companies by selling assets of loss-making SPCs to its highly profitable SPCs at prices lower than the fixed prices. Lone Star Fund suspected to have illegal profit of KRW 40 Billion by decreasing stock price in order to decrease the price on their acquisition of KEB Credit Card by spreading the false information of capital reduction. Former president of KEB is declared to be guilty not for the Lone Star case, but for the another bribery case. Lone Star was declared not guilty on KCC stock price manipulation, but guilty on malversation of manipulating the earnings of SPCs. Both Lone Star and prosecution announced to appeal to the Supreme Court. Former head of the Finance Ministry’s financial policy bureau is given a verdict of “not guilty”, and he is working as a managing partner of one of the biggest Korean Private Equity Fund, which is funded by most of major Korean banks including KEB.